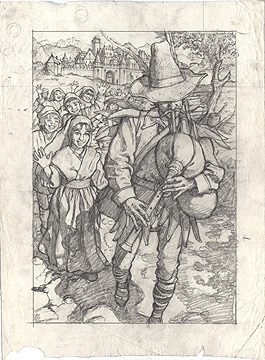 From the "Pied Piper" story in Greg Hildebrandt's Favorite Fairy Tales book. This is the drawing Greg used to transfer for the final painting that appeared on page 119 of the first edition book. Greg Hildebrandt's Favorite Fairy Tales was published by LITTLE SIMON, a division of Simon and Schuster, Inc., in 1984.